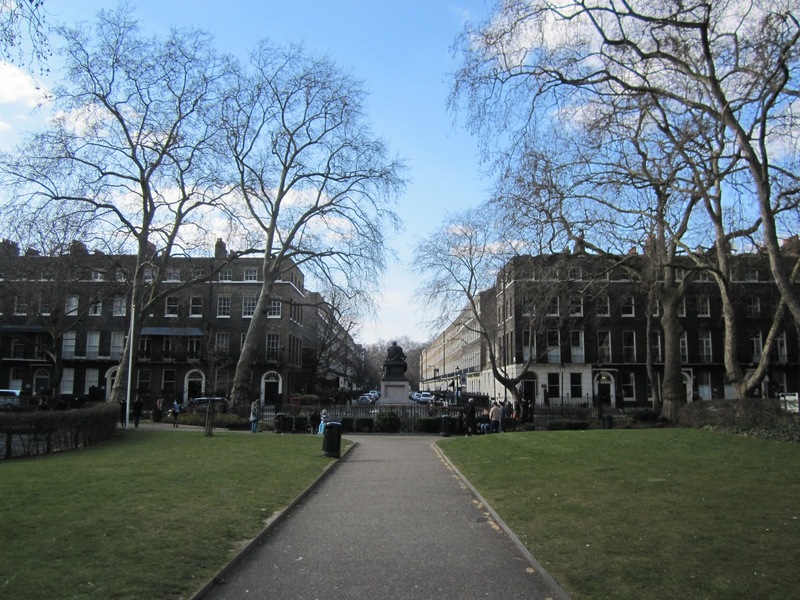 Bloomsbury Square, originally Southampton Square, was the first such to be called a square in London. It was built on the lands of Thomas Wriothesley, fourth Earl of Southampton. The earl had plans to build on his estate as early as 1636. However, the licence was withheld, and the first building to be constructed only appeared in the last years of the Commonwealth. This building was a large mansion, which the earl had built for himself, and which John Summerson described as being "somewhat in Inigo's style," referring to Inigo Jones. To the south of the mansion, the earl laid out a square with building plots to the west, east and south. The plots were offered as building leases, which meant that the earl retained ownership of the land, and that building was the responsibility of the lessee. At the end of the lease period, ownership was to be resumed by the lessor, including the house which he had shared no cost in building. The incentive for the speculative builder was presumably to build a house as cheaply as he could and sell the house for a profit. The earl was not permitted to sell the land even if he had wanted to. Ancestral estates could only sold by consent of Parliament. The first lease was granted in 1661. The street frontage of each plot was 24 feet, but plots still had unequal sizes and rent rates according to the depth of the plot. On average, ground rents were about £6. Lessees could not just build whatever they wanted. Each house was to be built according to the same formula: façades of plain brick with horizontal bands at each floor level, and topped with a wooden cornice and a pitched roof with dormers. John Summerson, commenting in 1945, explained that one or two of the original houses remain but are so "heavily disguised under Victorian stucco as to be unrecognisable. "A revised edition of that text was printed in 1978, so we may assume that the assessment is still more or less current. He was probably talking about numbers 9 to 14. The "Victorian stucco" is from 1860, and, as indicated, the façades as they appear today are completely different from the originals. There are some remaining features of the interiors that are pre-Georgian, though, such as the location of the staircases. However, It is numbers 5 and 6 that look the oldest. 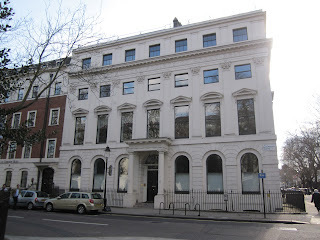 5 Bloomsbury Square was apparently built in 1703, which is probably about right for number 6 as well. As such, they may in fact be originals but no sources I have seen confirm this definitely. 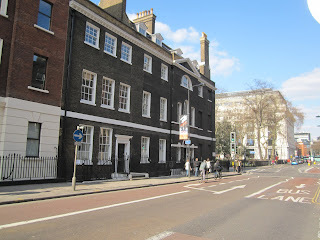 The current façades are from 1744 and were by the architect Henry Flitcroft. 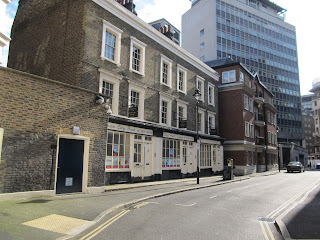 The most obvious of the alterations made by Flitcroft is on the façade just around the corner facing Bloomsbury Way. It has a slightly projected bay crowned with a pediment. Other signs that the façades are not original include the stone bracketed cornice and brick parapet, stone band at first floor level, and the entrance doorways. The window sills are also in stone. Based on the description of the original, the changes on the Bloomsbury Square side appear to have been rather subtle. Im not sure if the original style had sash windows or flat gauge arches in brick or what type of brick was used. As such, the comparison is somewhat limited. The two houses have been divided into three units and are Grade II listed. Number 17, at the corner of Great Russell Street is also occasionally referred to as a heavily altered original. 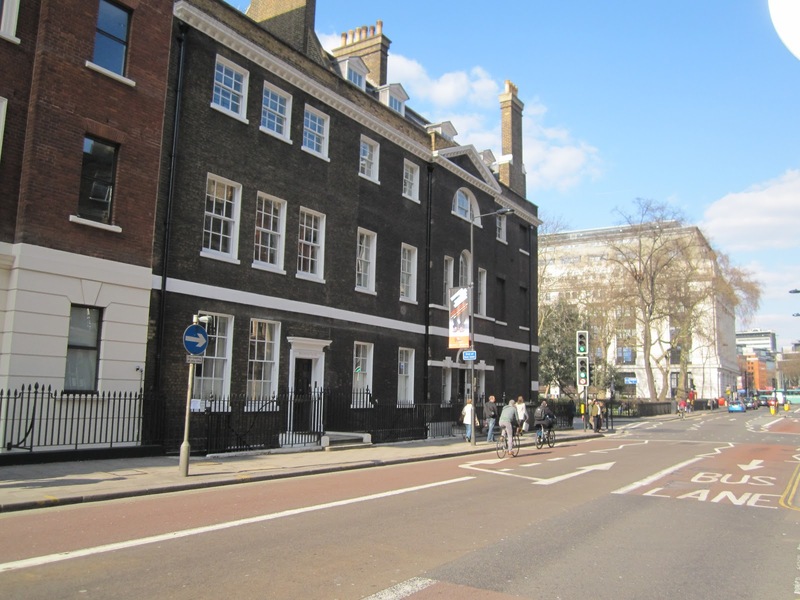 In 1777 the house, and it seems the land as well, belonged to Sir John Rushout who made an agreement with John Nash to redevelop the house, subdivide it into two units, and construct new houses along Great Russell Street (Nos. 66-71). Nash acted as a speculator rather than architect, though the redevelopment of the interiors are mostly attributed to him. The new stucco façade with corinthian pilasters and rusticated ground floor was designed by the Adam brothers on commission. Nash failed to sell the new houses, and had to declare for bankruptcy. His first investment scheme was in other words a financial failure. The building was later acquired by the Pharmaceutical Society of Great Britain. The Society is responsible for the addition of an extra storey and the entrance porch, and probably the pediments over the first storey windows. In 1958, the Society gained the property as a freehold. Southampton House was renamed Bedford House when the estate passed via marriage to one of Thomas Wriothesly's daughters by Willam Russell, first Duke and fifth Earl of Bedford. The house was demolished in 1800, following two acts of Parliament allowing the then Duke of Bedford to redevelop the site. 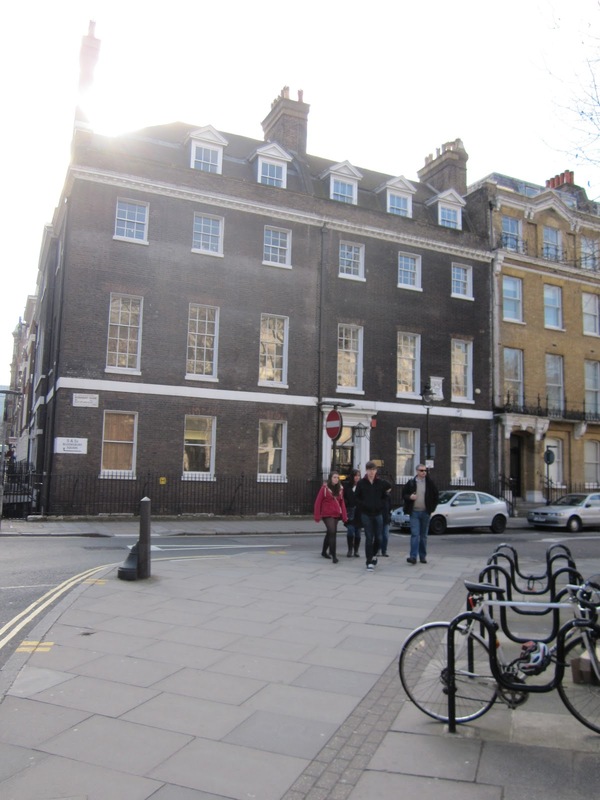 The residential units constructed along the new street, Bedford Place, was a project by James Burton and was completed between 1801 to 1805. On the eastern side of the square, all the original houses were removed to make way for Victoria House, built between 1926 and 1932. To the south lies Southampton Place, which is pretty much 18th-century, most of the houses here were done by Henry Flitcroft. Originally, Thomas Wriothesly also laid out some of the adjoining streets for development. Barton Street was the site of a market place. The oldest remaining buildings in this lane are from the 19th century.